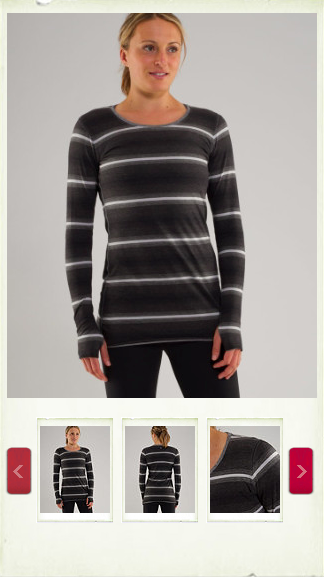 I really love a great Lulu- like find at places like Old Navy. I was originally disappointed that the Cabin Tee Long Sleeve in Black Swan wasn’t going to work out for me so I was on the look-out for a long sleeve tee with the same casual look as lululemon and the same softness as the Pima cotton so that I can layer it under things like Scuba’s or Wraps. 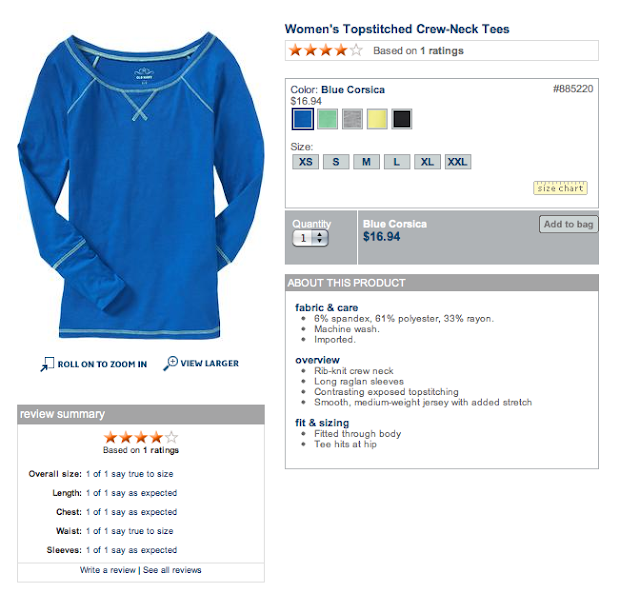 I was surprised to see these crew-necks (almost a boatneck really) on the Old Navy website and went out in search of them at local stores to see if I could feel the fabric before buying. I sadly didn’t find them in store and since Old Navy was having a 25% off sale online I decided to place my first website order from them. Little did I know that Lulu would be releasing these new Ombre Stripe Cabin’s on Monday which I ended up really loving so I was all set to return these Old Navy ones as soon as they arrived but I ended up really loving them also and the soft jersey fabric was the winning factor. The shipping process was super fast and the items arrived 4 business days earlier than quoted. For $16.49 they are a really great alternative to Lululemon’s $68 version. They are TTS but if you want the same casual relaxed fit of the Cabin ii then I would size up one or even two depending on how relaxed you’d like it, especially for more arm and torso length. I have mummy tummy to contend with so I will probably layer a white Modern Racer Tank under this if I wear them with my jeans since they are a little sheerer than the Cabin which has two layers. I could return these for a size up but that means ordering online and waiting and I can’t be bothered. Muffin top be damned! 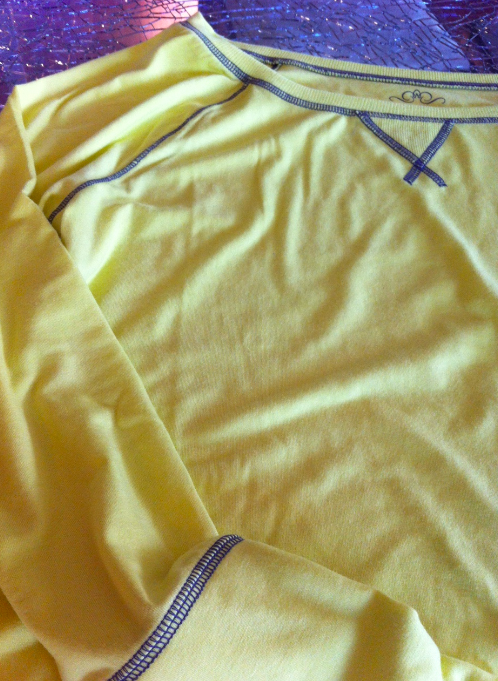 One thing I really love about these is that the jersey material feels exactly like my Chirp Lux Remix only silkier. 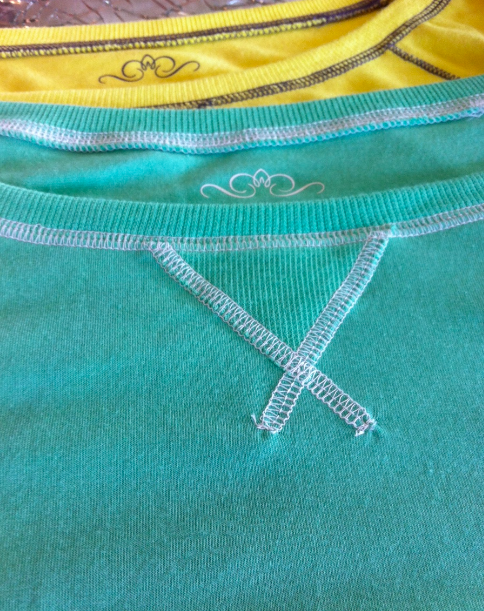 I also really love the contrasting stitch on these and the high cuffs at the wrist which is what I miss from the original Lululemon Cabins. The only thing this is really missing is the thumbholes and also the reversible option. I suspect that with time these will pill in the wash but thankfully I have two fabric shavers which I regularly use to groom my Lululemon clothes and for $14.95 after the online promotion code it just can’t be beat. Hopefully I’ll see these at my local store soon so that I can pick up a few more colors. The US side of the Old Navy website has them priced at $16.95 today with a 30% discount so make sure to grab them if your thinking about it. I only wish there were more colors to choose from. See, slightly muffin top unfriendly but I can either layer with a white tank underneath or I can wear these with my Stills and Grooves for the ultimate mommy uniform. And my purchase from yesterday. 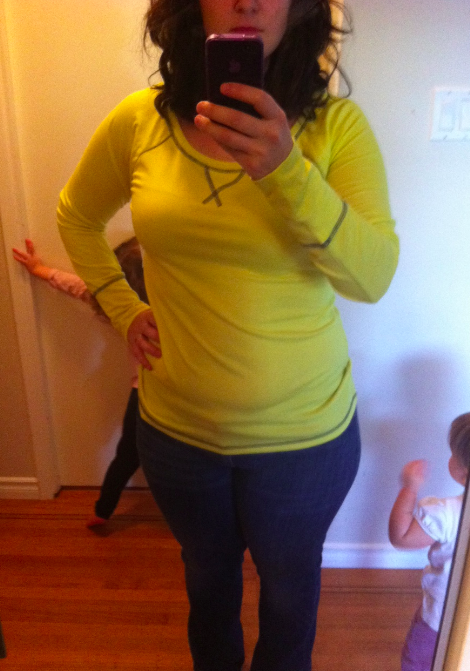 I wore this top today with my jeans and it passes the muffin top test. Mostly because of the optical illusion of the stripes. "New Jacket! Off The Mat Jacket and Turn Around Long Sleeve"